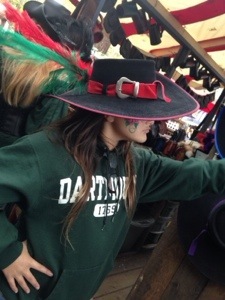 Yesterday, we went to King Richard’s Faire. It was, to be blunt, an epic disaster. 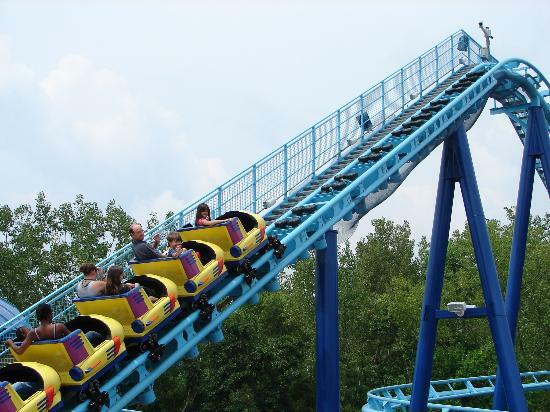 Because her idea of a ride is this .. The crowds were overwhelming. Shows were happening everywhere, meaning that random groups of humans were clumped together in unpredictable ways everywhere she turned. It was, to put it mildly, awful. Within three minutes of spending our $88 to get in, Luau and I realized that the only shot that we had of making a go at this would be to split up. He took Brooke to the uh, rides, while Katie and I wandered around. 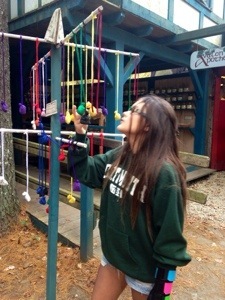 Katie gleefully declared the place, “Dork Heaven.” Which apparently is a good thing. 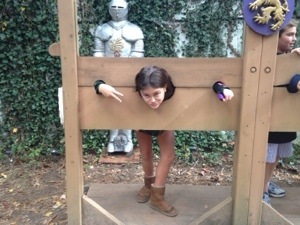 They had the stocks, where it is said that errant tweens were held and put on public display in the town square during Medieval days. As you can see, this one is using some sort of gang sign to communicate with others. 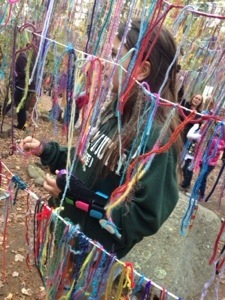 They even had this nifty woodland fairyland where visitors were handed strings to tie on to the structure, and in so doing, make a wish. 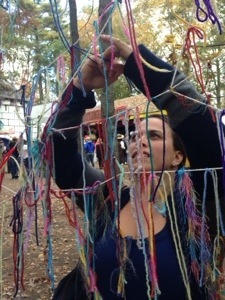 Katie asked that I not share the picture that I took of her wish-making because it was kind of a private thing. I thought that was sort of beautiful. Thankfully, I got a pre-wish photo, so here it is. She even took one of me making my wish, which was more of a prayer that I may or may not have cried a little while making, so we’ll just leave that alone. 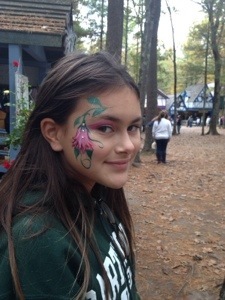 I had told Katie that she could choose one thing to buy from the fair — er, buye from ye olde faire. Every time she picked something up, she’d say, “So this would be my one thing, right?” and, with confirmation that, yes, that would be her one thing, she’d put it down again. Until we came to a shop selling hand-made leather-bound journals. There was no turning back; she’d found her thing. It was a burgundy leather book filled with hand-pressed paper and finished with a nifty old-fashioned lock. Even though she was sure, I convinced her to keep walking just in case. She agreed, left the shop without it, made it ten feet and said, “I’m not going to see anything I want more than that.” We went back in and bought it. Meanwhile, Luau and Brooke were struggling. He finally texted me to say that they were at the end of their rope. We found each other and she collapsed into me. I took her in my arms and sent Katie and Luau off to go and get some food. I have no idea what to say about that time. All I’ve really got is what I would write when we were in the car later on our way home. But at the end of the day, when we’d both once again found our respective calms, I’d go searching. Because there had been one moment, just one moment, of magic at that damned fair before it had gone to hell in a hand basket. And I’d captured it. And I was determined to find it. Because I wanted her to remember that even in the midst of the nightmare, there was a moment that was pure and good and sweet. She needed to know that. So we looked at the photos together as we lay in her bed. And we laughed. 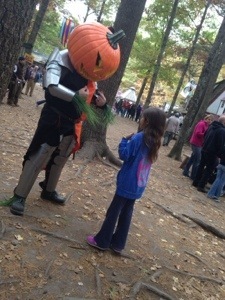 Because Brooke had seen this guy wearing armor and a huge pumpkin on his head. And when she did, she’d run up to him and, without a word, engaged him in a round of Pat-a-Cake. Because, clearly, this was a guy who looked like he’d want to play Pat-a-Cake. And wouldn’t you know it – he did. There are days when this road feels impossibly hard. When our children’s pain is more than anyone could be expected to bear. On those days, there is nothing easier, nothing more tempting, than giving into the darkness. It’s there. And it feels like it’s all that’s there. But damn it, it’s not. There is light in the cracks. And there are always cracks and there’s always light coming through them. There is nothing more important, especially for our sweet babies, than finding it. 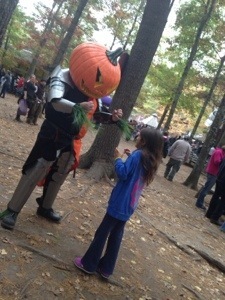 Even if it happens to be a knight in a giant pumpkin head playing Pat-a-Cake. 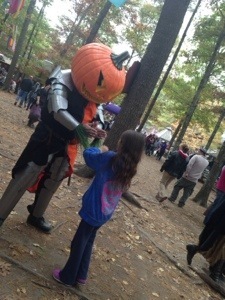 * Thank you, Pumpkin Man. Another beautiful post. Thank you. I truly believe that just exposing our children to outings like this gives them the ammunition to deal with more when they are older. 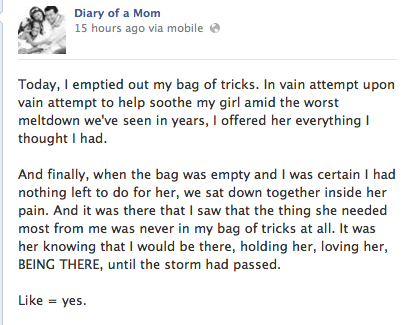 She WILL draw on that great moment, she’ll remember what didn’t work and eventually stay away from that part. It will get easier because the more she is exposed to gives her a larger inventory of “what to expect” to draw from. You just trying even though it might not work out this time is giving her more information for later. I know this to be true. So good job. Keep trying, keep showing her the world. I think what she will remember most of all is that you had experiences, that you are a family, together (even when you split up to do things each child likes.) That you were there. Really there. And who could for get that awesome pumpkin headed man? 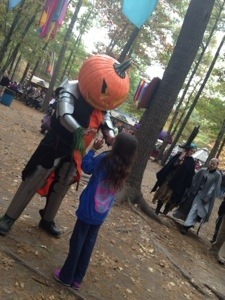 I never thought I would respect some random, patty-cake playing pumpkin-headed guy…but there it is. 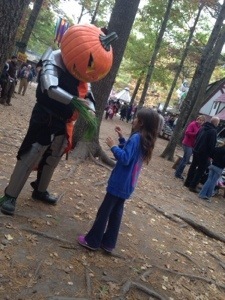 pumpkin head respect. Great post! It reminds me to not shy away from the challenges that our children face or that we face. We took our son last year and it was a bit much for him but he was still young enough to be in a stroller so there was some place for him to “rest”. Thank you for reminding me to have courage and enjoy the good moments a midst the tough ones. Like Katie, the journal place is my favorite as well. Hard to leave there without one. Maybe she will have a passion and talent for writing, the same as yourself. Wouldn’t that be Sir Jack de Lanterne? Love the light through the cracks! 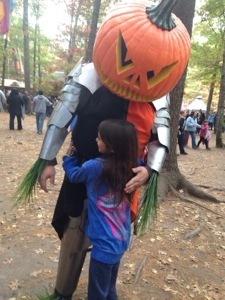 Pumpkin Knight probably will never know how much he meant to you yesterday. Wonderful post, the journal sounds beautiful, may she fill it with her deepest thoughts, prayers and wishes and a few doodles… thank you. What a gentle, discerning soul there was inside that armor. This is wonderful. 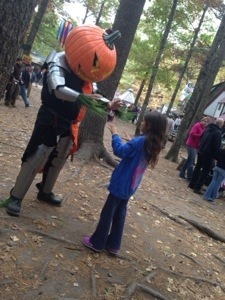 And so is Pumpkin Man. My family loves the Maryland festival, our son (now 21) has pretty much grown up there (this is our 19th year attending), and we’ve run into so very many people who accept him as he is. 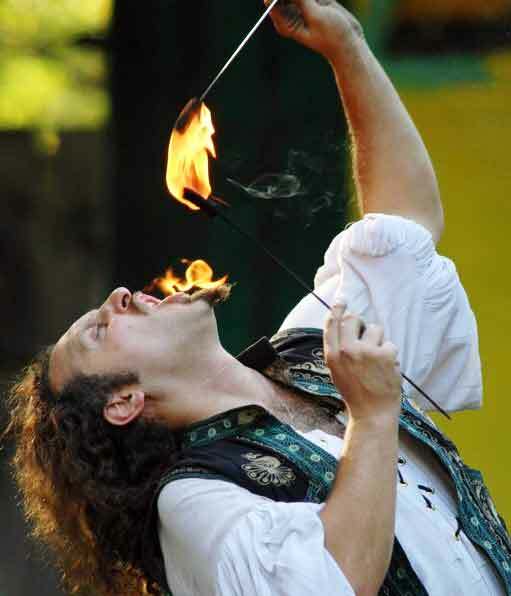 When we first started attending it was rough, I told him (once figured it out after a few years) that he could spin, flap hands, whatever he needed to do, anyone who stopped to look at him instead of the pageantry had more issues than he did :-). I’ve seen performers go out of their way to make him comfortable. 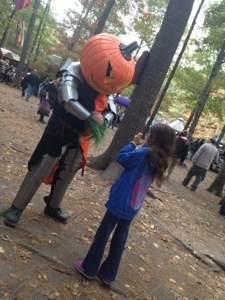 A knight who stopped in the street to put a hand on my son’s shoulder while my husband was tying his own shoelace. 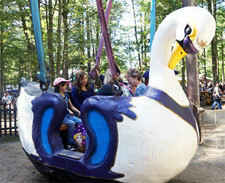 (I was off at another part of the grounds). When my husband stood up, he and the knight exchanged a nod, and then all were on their way. We’ve had a performer restructure the human chess game so that my son could participate. He’s been chosen to be on stage as a volunteer. He’s suggested jokes for other performances. He’s been encouraged to write sonnets, and had his writing read publicly with Shakespearean flair (my son’s work has been performed!). After all these years attending, he’s able to choose his own shows (as of the end of last season – it too time), he can head off on his own, and meet us back at the appointed time and place. 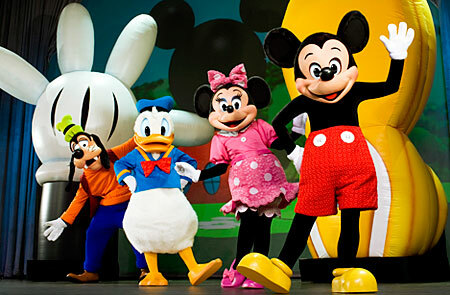 It’s a magical place for us. Thanks for sharing your joy in the midst of the difficulty – the celebration of what does work and is wonderful and magical.